The notion that employees might become owners of the companies where they work has centuries of history, but in the early 1970s, employee ownership in the U.S. was mostly confined to a handful of experimental companies. Over the last three decades, however, a stealth economic revolution has occurred. By 2006, the General Social Survey estimated that 35 percent — or more than 25 million — of the employees who work for U.S. corporations were participating in one or more stock ownership plan in their companies. A series of tax laws enacted between 1974 and 1997 (most notably employee ownership incentives in the Employee Retirement Income Security Act) made this transformation possible. The incentives rest on a core assumption about the market economy: The best way to accumulate assets is to own equity. That was largely true in the 1970s and is even truer now. Real median wages have essentially been stagnant for 30 years, but the Dow Jones industrial average, now at roughly 8,500, had just three digits 30 years ago. The message is clear: If you own assets, you have done quite well. If you work for the people who own the assets, you have struggled to get by. Of course, the current market may make the notion of owning equity seem quaint. As I write this, the market is off about 40 percent from its record highs in 2007. But consider: The Dow was at 770 in January 1978; in 1987, before it crashed, the Dow surpassed 2,700, for a nearly 300 percent increase in less than a decade. And historically, the stock market has an annualized return of 40 percent in the years between bear markets, Ernest Ankrim, chief investment strategist for the Russell Investment Group, says. Thirty years ago, the federal government decided to use the tax code to provide incentives that would broaden the ownership of wealth and, it was hoped, improve corporate performance through what are known as employee stock ownership plans, or ESOPs. ESOPs have, in fact, been a real success story. Research by scholars at the University of Pennsylvania shows that the most dramatic form of employee ownership — in which employees own so-called "S" corporations — has an especially significant positive impact. Wealth is still highly concentrated in the U.S. 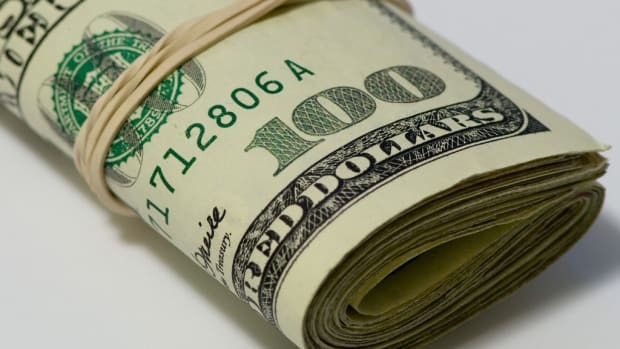 According to the latest available Internal Revenue Service analysis, the wealthiest 47,000 families in the country — that is, those with more than $20 million in assets — owned almost $1.2 trillion in public and private corporate equity. The richest 1 percent of the population owns more than the bottom 90 percent, and the top 1 percent owns about three-quarters of all U.S. wealth (with the percentage increasing). But reducing that concentration by increasing employee ownership does not require expensive new programs or tax incentives. Recent research shows that a very modest federal investment in programs that disseminate information on ESOPs could reap huge dividends, not just helping employees and companies but actually bringing increased revenue to the federal treasury. As of 2007, my nonprofit research organization, the National Center for Employee Ownership, estimated that 11.2 million American workers owned all or part of their company through an ESOP. The employees&apos; stakes in nearly 10,000 companies were valued at about $925 billion. Between 30 and 40 percent of the companies were owned entirely by their employees. ESOPs, of course, are not the only form of employee ownership. Another 9 million employees have stock options or other rights to an equity interest in their companies. There is no way to value these awards precisely; the total has been estimated at a few hundred billion dollars. In addition, 11 million employees buy stock in their companies through discounted stock purchase plans. There is no reliable way to estimate the total of such purchases. But according to the Employee Benefit Research Institute, in 2006, about 11 percent of 401(k) assets were held in company stock, mostly in large public companies, which translates into a total of roughly $350 billion. Such seemingly positive statistics notwithstanding, it isn&apos;t hard to find well-publicized employee ownership meltdowns. The employees at Enron, WorldCom, Lucent and many other firms saw the value of their 401(k) plans plummet in the wake of accounting scandals and other business implosions. ESOP-owned United Airlines showed just how dysfunctional employee ownership could be. Begun in 1995, the United plan —which excluded the most important customer face of the company, the flight attendants — had only a five-year life, after which it terminated, giving no one a reason to try to make long-term changes in how the organization would run. Efforts to engage employees in work teams were wildly successful in the first year, but new management did not like the idea of sharing power, and unions decided a cooperative approach was too threatening to its adversarial tradition. After great initial success, the ESOP became just another airline company financial disaster. Similarly, an ESOP purchase of controlling interest of the Tribune Company (owners of the Chicago Tribune, Los Angeles Times and other media properties) seems to be working out very badly, coming on the cusp of the mortgage meltdown, looming recession and an attendant drop in ad revenues. Layoffs have followed layoffs, as Tribune and its colorful, profane and at times impolitic CEO, real estate titan Sam Zell, scramble to pay down the massive debt taken on to finance the $8.2 billion transaction. But it is just as easy to point to extraordinary success stories. Microsoft, Google, Cisco and many other technology companies are creating thousands of millionaires, all the way down to the receptionist level, with their stock-option programs. Southwest Airlines, Whole Foods and Starbucks, among others, make broad ownership a key component of their compensation philosophy. On the ESOP side, consider such success stories as Publix Super Markets, whose 145,000 plus employee-owners have consistently helped it rate at or near the top of Wall Street Journal customer satisfaction reviews; Davey Tree, the 7,000-employee majority ESOP-owned company that has grown to be the largest tree service company in the U.S.; or W.L. Gore & Associates (maker of Gore-Tex), whose 7,000 employee-owners have helped it be rated by Fortune and Fast Company as the most innovative company in America. In each of these cases — and many others — rank-and-file employees accumulate well into six figures in their account balances over 10- to 20-year careers. Most ESOPs, however, are in smaller companies, such as ESOP-owned McKay Nursery Company, a Wisconsin commercial nursery with about 150 employees, over 90 percent of whom are migrants and 95 percent of whom return to work seasonally year after year. And why not? Those who come back for a six-month annual stint for a decade will have accumulated well over $100,000 in account value. These stories — both positive and negative — are memorable, but they are only stories. To understand the value of employee ownership, we need to look at what the research on the broader phenomenon tells us. The first question to be asked is whether employee ownership is actually good for employees. Coming from an advocate of employee ownership, my answer may seem surprising because it is not a simple "yes"; it depends on the kind of ownership. An ESOP is a kind of employee benefit plan; employees almost never pay for the stock in their ESOP accounts. To create an ESOP, a company sets up a trust fund and contributes new shares of its own stock or cash to buy existing shares. Alternatively, the ESOP can use borrowed money to buy shares, with the company making cash contributions to the plan to repay the loan. Company contributions to the trust are tax-deductible, within certain limits. Shares are allocated to individual employee accounts. The benefits vest in less than six years. When employees leave the company, they receive their stock, which the company must buy back from them at its fair market value. ESOPs can own all or part of a company. Only about 5 percent of ESOPs are in public companies, where they are mostly used as a match to employee contributions to 401(k) retirement plans. In 1997, Congress expanded the universe of potential ESOPs, allowing corporations formed under subchapter S of Chapter 1 of the Internal Revenue Code to sponsor ESOPs. In an S corporation, the company passes federal tax obligations on to its owners; by law, an ESOP does not pay tax. So a company owned completely by its employees in a subchapter S situation would owe no immediate taxes on its profits. These taxes are instead paid by employees, when they take assets out of the tax-protected ESOP. In 1998, Peter Kardas and Jim Keogh of the Washington State Department of Community, Trade and Economic Development and Adria Scharf of the University of Washington published a comprehensive study of the effect of ESOPs on wealth, Wealth and Income Consequences of Employee Ownership. The study used 1995 state data and a survey to match 102 ESOP companies with 499 comparison companies. The study found the average value of all retirement benefits in ESOP companies was $32,213. The average value of retirement assets in the comparison companies was $12,735. In 2007, the National Center for Employee Ownership looked at data from all ESOP companies that filed with the Department of Labor and found that the average ESOP account balance was about the same as the mean 401(k) account balance nationally. But a 1998 analysis by Rutgers professors Douglas Kruse and Joseph Blasi showed that ESOP companies were much more likely to have secondary retirement plans than non-ESOP companies were to have any kind of retirement plan. So, the research shows, ESOPs are primarily an add-on benefit. Moreover, because of their rules, ESOPs are more inclusive than 401(k) plans and less skewed toward highly paid executives. Another common form of employee ownership involves stock options: the right to buy stock at a price fixed today for a certain number of years into the future. In their 2003 book, In the Company of Owners, Blasi, Kruse and BusinessWeek Associate Editor Aaron Bernstein report that employees in companies with broad-based stock-option plans get about 7 percent higher pay than employees in comparable companies. Options do not substitute for benefits, so whatever employees get is "gravy." Surveys by my organization in 2001, 2004 and 2008 showed that the typical hourly employee receiving options would realize additional benefits of about 8 percent of pay per year. In a third path to some company ownership, employees often are allowed to buy company stock as a 401(k) investment, or the company may match the employee contribution in company stock (or both). Here, the benefits of employee ownership are different — and in many cases nonexistent. 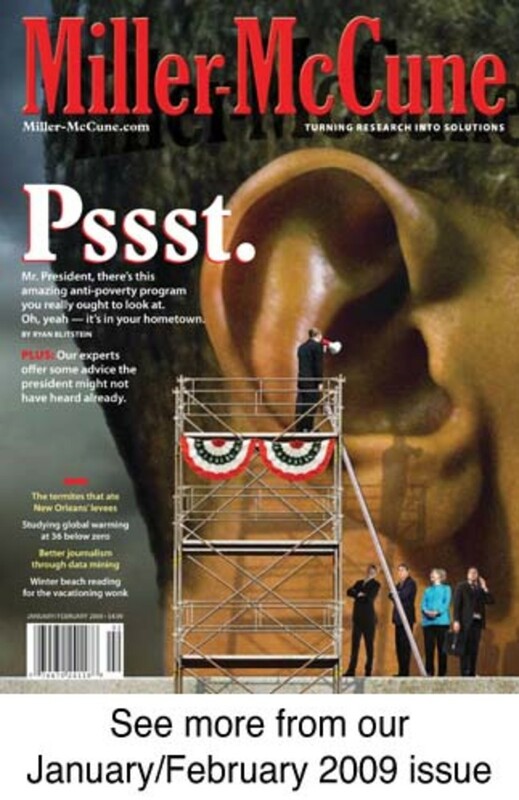 In her October 2005 article "Company Stock in Pension Plans: How Costly Is It?" in the Journal of Law and Economics, Lisa Meulbroek found that employees who invest 401(k) assets in stock in their own companies face about a 42 percent loss in market value, relative to what they would have earned had they invested in a diversified portfolio. While there are striking success stories for some employees who fill their 401(k) with company stock, the risks of overconcentrating in any one asset — as illustrated by Enron and other companies that have gone bankrupt, wiping out retirement savings of thousands of employees — argue strongly that employee ownership should be a limited part of investments in plans meant to be primary retirement vehicles. It&apos;s clear that ESOPs make a positive contribution to company performance — so long as employees own significant portions of their company and, perhaps more important, are allowed to participate meaningfully in management. In a 1997 study, Blasi and Kruse found that companies with ESOPs grew about 2.3 percent per year faster in sales, employment and productivity than would have otherwise been expected. In 2001, they and colleagues Maya Krumova and James Sesil found that companies granting stock options to most or all employees saw a 17 percent increase in productivity in the three-year period after adoption of the option plan over what would have been expected based on industry performance. Multiple other studies have come to similar conclusions. A. Create an annual $14 billion in additional annual wage compensation that would not have been paid, absent an ESOP. B. Lead to job-stability gains worth another $3 billion from reduced turnover and job loss. C. Provide an additional $34 billion of stock gains (outside of wage gains) in the accounts held by participants. Employers pay for the employee benefits derived from subchapter S ESOPs through performance gains estimated at $33 billion per year. 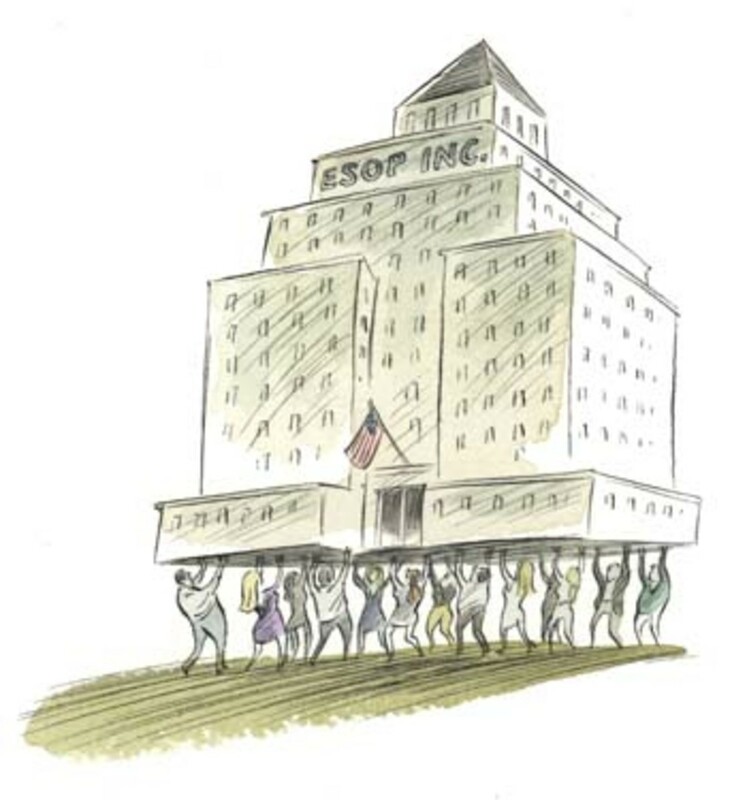 The increased economic performance of ESOP companies — plus the fact that foregone taxes on earnings are ultimately paid by employees when they start to take benefits out of the plan some time after termination — also mean that subchapter S ESOPs are a net gain for taxpayers, according to a 2008 study by the Wharton School of the University of Pennsylvania. These findings go back to a 1986 study I did with Michael Quarrey for the Harvard Business Review. We found that participative ESOP companies grew about 8 to 11 percent per year faster than expected. The ESOP companies that had the least employee participation actually grew 6 percent per year more slowly than expected. 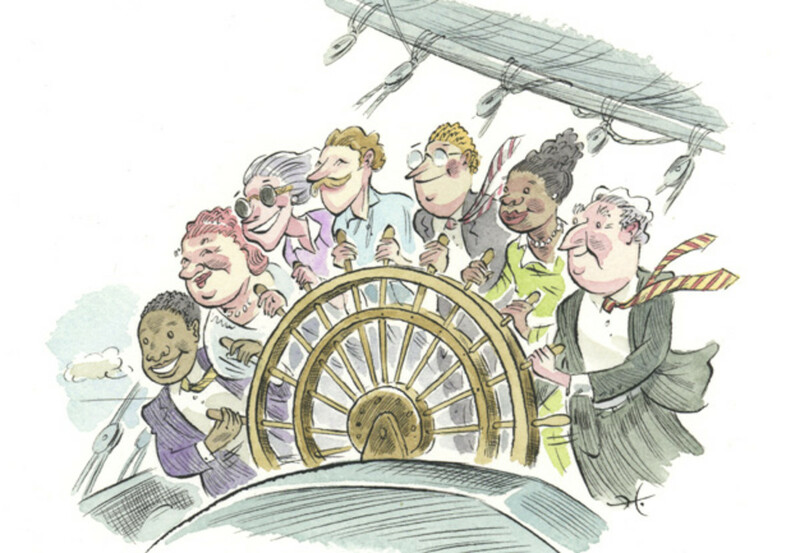 At a 2006 Russell Sage symposium, academics convened by the National Bureau of Economic Research concluded that for any form of "shared capitalism," performance was a function of just such participatory management practices. Participation in management without ownership in the company is often touted as creating a "sense of ownership" among employees. But benefiting from that sense is rather like enjoying a sense of lunch: It may seem enticing, but it&apos;s not very satisfying. Absent a meaningful stake in the outcome, employees and their supervisors have little reason to continue active support for a program whose benefit redounds to someone else. The government already has the basics right on encouraging employee ownership of companies. The tax structure for ESOPs, the most powerful ownership vehicle, is a sensible one. Its cost — generally less than $2 billion per year in deferral of federal tax receipts — is modest compared with its benefits. On the 401(k) front, Congress already passed reforms in 2006 that have led the percentage of employer stock in these plans to drop from a high of 19 to 11 and falling, an outcome we endorse. In regard to stock options, rules could be changed to discourage companies from overconcentrating options and other awards at the executive level, but we recognize that achieving this reform is a daunting political task, given the large amount of campaign contributions that executives give to members of Congress. There is a modest proposal that would strengthen employee ownership, improve company performance and, ultimately, benefit the taxpayer: The government could provide minor funding — of perhaps several million dollars per year — to help establish and support state organizations that make workers more aware of the benefits of employee ownership through meetings, publications and other types of networking. Several states had these programs in the 1980s, and an analysis by my group found they increased the incidence of employee-ownership plans by about 25 to 35 percent. Subsequent budget cuts have left only Ohio, Vermont and Massachusetts with active programs to promote awareness of the benefits of employee ownership. For a small federal investment, workers in the 47 other states could learn how to take advantage of those benefits for themselves, their companies and, ultimately, their country.